Earlier this week, Jim and I did a podcast focusing on Independence War 2: Edge of Chaos. Now, as I said in the podcast, I’ve been giving this game crap for many years because it’s just so mean to the player. It has a difficulty wall which, I feel, ramps up way too early, it makes what should be very basic information hard to find, and rather than focus on usability, some things in the game focus solely on the pretty/whiz bangness of it all (i.e. the starmap, for example). I tried playing the game several times over the years and always hit these barriers, or more accurately, I felt like they hit me right in the face. However, because Jim and I were going to talk about the game at length, I decided to persevere more so than I had in the past, and in doing so I discovered something astounding. Independence War 2 is an amazing F#$%ing game. I was getting in too close to my targets, treating the game like a more traditional dogfighting sim. Missiles would always be the death of me. However, once I learned to dance a little better and move around more using the WASD keys to control forward and lateral thrusters, I became harder to hit. I also found success in installing a manual countermeasures mod, since the game appears TERRIBLE and launching them on its own. Once I learned a bit more finesse at the controls, I had a much better time of things. Besides the difficulty, the other major problem this game has is its puzzle-like aspects. Several missions I’ve played have required the player to go things in a very specific way, but don’t really explain this to you clearly. 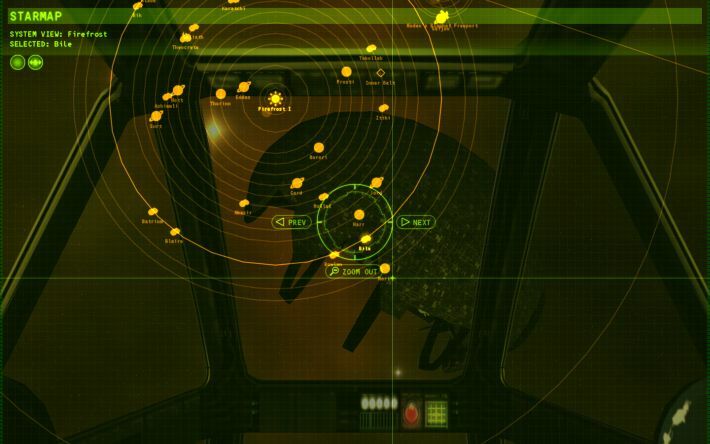 For example, in a mission wherein the player is to steal some turret fighters from a guarded installation, you arrive docked to a transport in order to blend in as cargo. The game then tells you there’s a remote cargo tug that moves cargo back and forth…and that’s it. I tried the mission three times on my own before submitting to using a walkthrough (hey, it wasn’t for review, I can use walkthroughs), and only then did I realize that not only was I supposed to remotely control the drone tug myself, I was to do it in a specific manner. I’d likely have taken much, much longer to figure that out on my own. The game apparently has a problem with easily giving the player information. It feels as if portions of the game were made purposely obtuse to increase the challenge or the “immersion”, such as the pretty yet horribly obtuse star map, or the dance one has to do to figure out which cargo to take to a drop off point (i.e. its in the trade screen, not the email you get asking for the cargo, for example). Once the user gets their head around this, it begins to make sense, but intuitive is not a word one could use to describe portions of this game. However, when it finally clicks? None of that matters. The starmap tomfoolery can be sidestepped by an amazing mod called “Location Finder” which gives the player a lovely alphabetical list, for example. Jafs’ inability to take more than six cargo pods — which can take FOREVER — can be sidestepped using a mod called Custom Jafs, which gives him a larger ship. Once you find the combination of mods — which you will totally need — and gain more skill in the cockpit, the game finally clicks, and becomes something of an amazing sandbox. And let me tell you, raiding transports (and combat in general) in this game is as joyous as it is frustrating. Once you begin to get the hang of it, you’ll find yourself dancing around your enemies, taking shots with guns and missiles while evading their shots as best you can at the same time. Combat is an amazing dance of inertia, speed and fire, and the explosions of enemy ships are just fantastic in this game, making the combat that much more satisfying. Sigh, I really can’t gush enough about Independence War 2 now, and I hope that’s a sufficient way of karmically apologizing for all the smack I’ve talked about it over the years. Lately it’s the only game I’ve wanted to play, and I can recommend it to just about anyone if and only IF they have a lot of patience and come to the game like a roguelike in which they expect to die a LOT. Once the initial hour or so has been passed, the game truly becomes something special. Thanks for reading my rave, folks, and have an awesome day! Srsly, I’m happy for you. IW2 is one of the most underrated space sims of all time. Although I remember there was a mission in the end of chapter 2 or 3 where you had to convoy some escaping ships through waves of enemies and that was one frakking incredibly hard mission – partly because it had a bug in it locking those NPC ships stranded in space in the middle of an autopilot jump. I’ve spent hours and hours trying to avoid it and also not losing ships to the attackers. On another note – have you seen new ships anounced in SC? Retaliator looks a bit weird but even more interesting than Connie. Pseudo newton > fighter plane physics. You can use the mouse with the WASD keys, via a virtual mouse driver. Makes that game even more awesome. Control of the ship is everything to me, which is why I just can’t get into games like X and freelancer. Hey, welcome, and how do you set the virtual mouse thingy up? Thanks for the post Brian. You’ve given me the incentive to throw some money at GoG and play this game again. I’ve also downloaded Location Finder, Custom Jafs, and Manual Countermeasures. Are there any other mods you would recommend? Hey Sean, good to see you! And those are pretty much the only mods I use. :) Enjoy, and good luck! I have most of the mods that Brian linked to, like Crosshair, Calscreen, dense fields, free form mode, multimod (important!) and TugFixed, which fixes the lateral thruster sounds for the Tug. Also I have forced DirectX 8 rendering, which I believe improves LOD as well as shadows. What does Free Form Mode do, exactly? Turn off the story missions? Nah, it enables the player to continue playing after the last mission ends. Effectively, it turns the game into full sandbox mode. However, I am not nearly there. Glad you found more value in this game. It’s got some of the best ambiance, although I have to dispute the “never see the same ship twice” part. Fight enough pirates and you’ll see Regicide and Deicide over and over again, and I still remember ship names like “Devil and the Deep Blue Sea” jumping in enough that it made me wish they had many more ship names. (Although it’s been years, so maybe they got an big update). Oh, heh, I guess that’s fair, I don’t really look at their names. I believe I meant you’ll never see the same combination of traffic at any one point. For the Torn Stars mod, the address is http://www.torn-stars.com/index.php?option=com_content&task=blogcategory&id=13&Itemid=49 . Thanks Brian. I have both I-War and I-War2 on my drive from GOG but never really got them going because, believe it or not I kept two legacy rigs with the originals installed on each to keep playing during all those pre-GOG years. I haven’t played in a year or so, but now I’m inspired to return to it. We (Stephen Robertson and I) worked with the folks at GOG when they were getting ready to release them, they wanted to try to get our paper models of all the I-war ships (still available at the paper model site) bundled with the game as one of the content bonuses. Great idea but they wanted to retain rights, etc. so it never happened. As for the Torn Stars mod which was really an excellent effort by a strong and dedicated team of volunteers to create the I-war2 sequel we all wanted, after doing all the writing and world-building, news stories that would appear, event scripting, dialogs, etc, I just kind of burned out. It took so long to get it done that by the time it was ready, I was busy raising kids, running a business, etc, and had too many other cool new games vying for my limited time. Good to see ya come around. IWar2 is one of the best Space Video Games I’ve ever played, and I wish there were a sequel to continue to evolve it. A modern synthesis of 1 and 2 would be sweet. I wonder if you’d like to list the mods you ended up with? I see several in your post. Since most IWar2 mods exist in zip files, you might be able to see them just by browsing to your mods directory. I recommend all those mods in Brian’s post. Try What Rocks! if you want to be a space miner. There is one (I forget which) that allows you to fly any ship in the game (cockpit view remains the same tho). Plus if you are a B5 fan, there are some excellent ship mods to choose from. All it does is fatten up asteroid and debris fields. Very easy to mod yourself to get even more “dense fields.” Interesting thing: it’s impossible to collide with any of the flotsam when you’re in LDS mode. Previous story Spacey Game News and Deals 10/10/13: Busy News Day!